MET League of Colleges constantly looks for opportunities to make the students sharper than the rest. 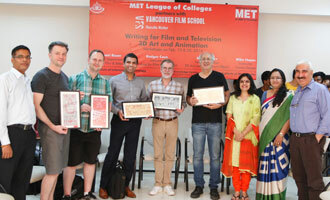 Recently MET, Mumbai in association with the Vancouver Film School, British Columbia, Canada hosted the two day workshop on 19th and 20th February 2016 for its Animation and Mass Media students. There were over 70 participants in these two workshops on ‘Script Writing for Film and Television’ and ‘3D Animation’.